Fresh oysters don’t have to be served raw. They can also be encased in a crispy batter to create a perfect canapé, satisfying snack or unexpected element of a main course. The crunch from the batter compliments the moist, salty oyster meat, making deep fried oysters a must-try for any seafood-lover. For instructions for opening or 'shucking' an oyster, have a look at our video. The salty flavour of an oyster and crisp batter coating are beautifully complemented by the fresh citrus flavours of lemon found in Nathan Outlaw’s citrus mayonnaise or the sweetness present in Chris Horridge’s apricot purée. 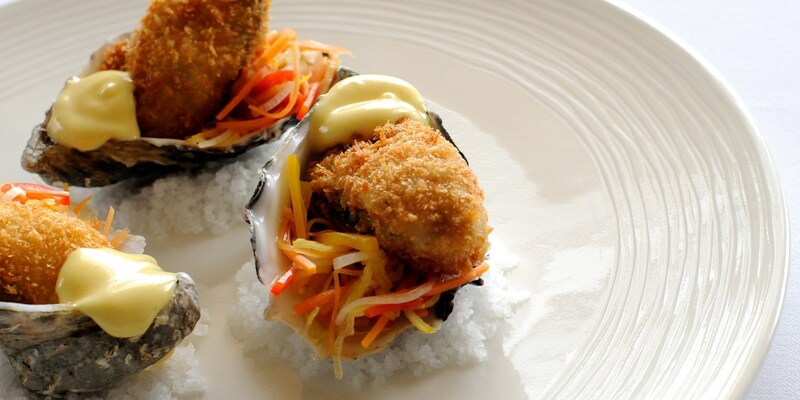 In contrast, a hot chilli dressing would also work well to bring out the inherent umami flavour of the oysters.